You can’t spell CHALLENGE without CHANGE. 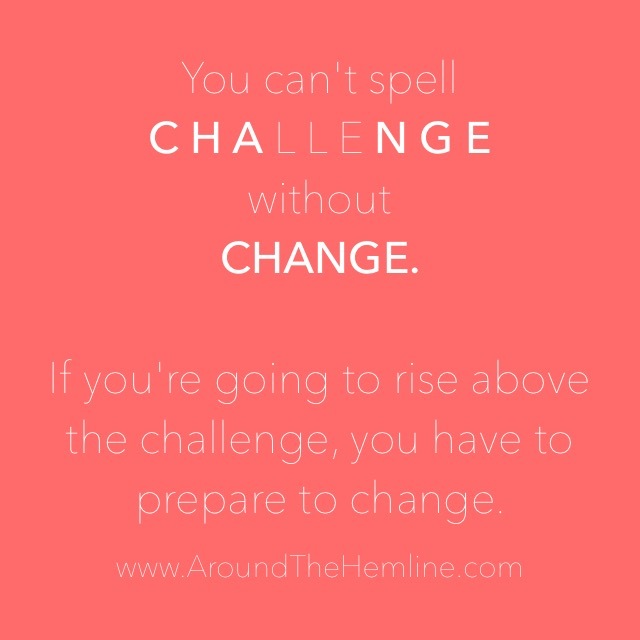 If you’re going to rise above the challenge, you have to prepare to change. As I embark on new challenges and adventures, the need for change has become inevitable. The challenges I put my body through to achieve fitness goals require change in lifestyle, change in eating habits, change in workouts and most importantly change mentally. New challenges are frightening yet at the same time exhilarating because you set out to prove yourself RIGHT, not wrong. You are proving to yourself you CAN do this, you CAN overcome this, you CAN change to make yourself better. When I feel like I want to quit my last set and I’m out of breath, THAT’S my challenge…to keep going. Your body can only take your so far but it’s the mental capabilities and strength that pulls you through tough times. This doesn’t apply to just fitness but in all aspects of LIFE. Through the most difficult times is when we grow the most because we hurt, we cry, we recover, we rest, and eventually we smile again. Don’t quit. Rise above the challenge and be prepared to make the changes necessary to reach your goals.